The Saab B 17 is the product of Sweden’s need to procure assets to defend its sovereignty and neutrality in the light of a gradually complicated international and regional context, to the point that it was prioritized over the equally capable and versatile Saab B 18. This aircraft was a milestone for the main company in the Swedish aerospace industry, as it was the very first airplane produced and delivered by this company following its acquisition and merge with ASJA, the aircraft branch of the Swedish Railroad Workshops company. It was also the application of the lessons and experience provided by the licensed-manufacturing of the Northrop 8-A1 bomber by AJSA/Saab. AJSA was already commissioned by the Defence Material Administration to develop and build a single-engine and light fighter-bomber, so Saab took over the design and development process in 1939 after both companies merged, evolving into the final light bomber, dive bomber and reconnaissance aircraft. Designated as the L 10 by ASJA, the design became the Saab 17, incorporating a good number of innovations and becoming a very versatile and adaptable airframe. Yet its time of service with the Flygvapnet was rather brief, as it was de-commissioned by the late 40’s. This was due to new and more powerful powerplant technologies such as jet propulsion. Instead, it served for a long period of time in Ethiopia until 1968. The Saab B 17 is a light bomber/dive bomber and reconnaissance plane with two seats, a single engine and a single tail, whose design bears a close resemblance with the Mitsubishi Ki-30 “Ann”, the Mitsubishi Ki-15, the Vought OS2U, and the Curtiss SB2C Helldiver, especially with the elongated shape of the main airframe and equally elongated windscreen of the cabin (as well as the same cockpit), which occupies most of the superior area of the airframe and it is fully incorporated in the fuselage. The wing is a mid-wing (cantilever) of trapezoid shape with a remarkable characteristic: where the retractable landing gear, which was covered with streamlined fairings, was placed, the rear part of the wing was divided. From the fuselage to the place of the landing gears, it was straight; from the landing gears area to the wingtip, it was angled. The forward area of the wing was straight, and the wingtips were rounded. The wing, from a frontal perspective, was slightly angled upwards from the landing gear area to the wingtip. It was also a reinforced wing to allow it to deal with the high stress by dive bombing missions. The Saab B 17 was powered by different powerplants during its career, as many versions had their own powerplants. The two prototypes (L 10) were powered by a licensed-built Bristol Mercury XII of 880hp by NOHAB (Nydqvist & Holm AB) and by a Pratt & Whitney R-1830 Twin Wasp of 1065hp each. The first production version (B 17A) was powered by the same Pratt & Whitney R-1830 (S1G3C) of 1050hp, while the B 17B (and also the B 17BL and B 17BS) was powered by a licensed-built Bristol Mercury XXIV of 980hp, with the B 17C powered by a Piaggio P.XIbis R.C.40D of 1040hp. Consequently, speed tended to vary from version to version as well. For instance, the B 17A could reach speeds of up to 435 Km/h (270 mph); the B 17B could reach speeds of up to 395 Km/h (245 mph), the B 17BL and B 17BS could reach speed of up to 330 Km/h (205 mph); and the B 17C could reach speed of up to 435 Km/h (270 mph). The landing gear was also varied from version to version, as it could have the classic set of two wheels at the wings and a small tailwheel, skies as replacement for the wheels, and even special twin floats permanently attached. This gave the B 17 considerable versatility, as it could take off and land in normal runways to snow-covered terrain, and also in water surfaces. The armament had no modifications, comprising of two 8mm Ksp m/22F machineguns placed at the forward section of the wings and after the landing gear area, a single and moveable 8 mm Ksp m/22R machine gun firing backwards for the observer/navigator/radio operator, and a payload of up to a 500-kg (1,102 lb) bomb or 700-kg (1,500 lb) bomb. Interestingly, the dive bomber version had an under-fuselage trapeze to accommodate a 500 Kg bomb, along the wing weapons stations. And it had state-of the art avionics for bombers by the time, like the bomb-sight BT2 (also known as m/42) that increased precision, mostly the late versions. In addition, it had two radios, an FR-2 and FRP-2. The reconnaissance version had a camera placed at the bottom of the fuselage. The initial roles of the airplane were reconnaissance and artillery spotting, roles that were, however, already filled by other air assets such as the Fieseler Storch and the Hawker Hart. As a result, the new airplane was required to be a light dive-bomber as well. Nevertheless, the final model retained all of the two missions through its variants, as well as receiving a level light-bomber and dive-bomber role. It would also be used for target towing later in its career. The Saab B 17, like the B 18, had an American ‘soul’ as well, thanks to the 40-50 American engineers that were part of ASJA and contributed with the design and construction of the airplane, hence the abovementioned similarity with the American airplanes. And it needed to receive some structural modifications, especially for the dive-bombing missions, such as the reinforcing of the wings and the landing gear folding system. This could be retracted backwards and used as an airbrake, taking advantage of the fairing. Development of the B 17 began in 1937 when ASJA began works on its L 10; as Saab merged with ASJA that same year, it continued with the development of the given aircraft, which would be an all metal airframe – something that was a novelty as airplanes back then used to have wood and other materials part of the fuselage. Two prototypes were built, each one having a different powerplant and flying for the first time in May 1940. The test pilot, Claes Smith, assessed the design as a good one, despite the fact the cockpit wheel came loose and fell prior landing. During development, it was realized that some modifications were needed, like changing the carburetor air intake from the top of the engine cowling to the starboard side of the cowling. This was done to prevent the engine from stopping. A spin fin was also added. By the end of 1940, the first 8 B 17s were produced, entering in service with the Flygvapnet in 1942. Some issues delayed the production programme, however. Nonetheless, 324 airframes were produced between 1942 and 1944, with three main versions: the B 17A light bomber and later target towing aircraft, the B 18B – and its sub-variants B 17B I, B 17B II, B 17BL and B 17BS – light bomber and reconnaissance versions (this version was the one that received most of structural the modifications), and the B 17C bomber version. The B 17 had one of the shortest service period with the Flygvapnet, as it was retired 7 years after it was introduced; yet it remained in service in Austria, Finland, and Ethiopia until 1968. In Sweden, they remained in service with civilian operators and in very small numbers until 1959, where they received new avionics. 5 airframes remain, one of them airworthy and still operating today in airshows. Two are museum pieces in Linköping and one in Helsingør, Denmark. Two airframes are reportedly located in Lithuania. The design of the B 17 is similar to other aircraft used in WWII by other countries, meaning it has the typical ‘WWII style’. But instead of being the average WWII design, the B 17 has some remarkable and particular characteristics. The airplane is an all-metal airframe, with the bow having a cylinder shape thanks to the radial engine and the stern is topped off with the tail, and the overall airframe being elongated with a sort of conical shape. The airplane is also a semi-straight leading-edge wing airplane, but the wings also have a particular characteristic. In fact, the wings have a ‘divided’ shape, with the area of the landing gear being the dividing point. First, from the fuselage to the landing gear, the leading-edge is straight while the rear-edge is also straight, having two ‘dog-teeth’ that mark where the rear area of the fairings are located. Second, from the landing gears to the tip of the wings, the leading-edge of the wings are straight as well, but the rear-edges are angled, making this area of trapezoid shape. The tips are rounded. The wings also have a divided shape from a frontal perspective, with the landing gear being also the dividing area. From the fuselage to the landing gear area, the wing is straight. However, from the landing gear to the tip of the wings, it is angled upwards, similar to the Ju-87 Stuka or the Douglas SBD ‘Dauntless’, only that the angle is not as wide. The wing, furthermore, is installed in the middle of the fuselage (cantilever), also being reinforced. Such reinforcement can be seen through its thickness. The horizontal stabilizers are also of trapezoid shape, with the control surfaces per se having an inwards angle at the tip of the surface. The tail has a similar shape with the rudder occupying most of the surface and having also an inwards angle near the tip. Both horizontal and vertical stabilizers have an equally rounded shape. The canopy is another remarkable characteristic of the B 17, as it is very elongated, occupying almost 40% of the superior area of the fuselage and making an impression that the B 17 has a crew of three, rather than the actual crew of 2: the pilot and the radio operator/navigator/observer. As a result, the cockpit had a lot of space, which allowed the second crewman to slide the seat back and forwards between the two different workstations. Beneath the forward area of the cockpit was where the bombs bay was located. A long antenna was placed above the canopy, right after the pilot’s seat, with a long cable connecting it with the tail. The landing gear was of classic configuration, with two (extended) wheels placed beneath the wings and a third wheel placed beneath the tail. The two forward wheels have a particular trait that gave the B 17 another distinctive characteristic either in land or when in flight: the forward landing gears were covered with an aerodynamic fairing as it folded backwards, into the wing. The purpose was to use such fairing as an airbrake, yet it was not entirely functional as the hydraulic system wasn’t powerful. The fairings were met by a ‘hood’ of sorts at the wing; when the landing gear folded, it gave the landing gears cover a cylinder shape, making the B 17 to have two cylindrical structures at the wings while in flight, making easy its recognition while in flight. The B 17 went through a series of modifications, especially the reconnaissance versions, as they received floats – with the purpose of operating from water – along with small endplates (placed right before the wing tips) and aerodynamic struts. The landing gear, in turn, could be replaced with skis instead of wheels, an ideal device for winter or Arctic operations. The B 17 received three different type of powerplants. The first two prototypes were powered by a NOHAB-built Bristol Mercury XII and a Swedish-made Pratt & Whitney R-1830 Twin Wasp engines. The production versions had the following powerplants: a Swedish-made Pratt & Whitney R-1830 Twin Wasp (B 17A); a Swedish-made (by SFA) Bristol Mercury XXIV (B 17B and the different sub-variants); and the Piaggio P.XIbis R.C.40D (B 17C). All the engines were radial and air-cooled, with 9 or 14 cylinders. The propeller was a three-bladed Piaggio P.1001 variable pitch propeller. The engines yielded different speeds. The B 17A could reach speeds of up to 435 Km/h (270 mph), the B 17B could reach speed of up to 395 Km/h (205 mph), and the B 17C could reach also speeds of up to 435 Km/h (270 mph). The B 17 had a standard armament with no variation from model to model, except for those with reconnaissance tasks. It consisted of two 8mm Ksp m/22F mounted at the wings and firing forwards, and one 8mm Ksp m/22R mounted at the stern of the cockpit, which was moveable and could fire backwards. A 500 Kg (1,102 lb) (B 17A) or a 700 kg (1,500 lb) (B 17B andC) could also be carried. Some units of the B 17A were modified to carry air-to-ground rockets. The reconnaissance versions were fitted with a camera type N2. An advanced bomb sight named the ‘m/42’ was introduced to enhance bombing efficiency, especially at dive-bombing, reducing the angle of bombing. The B 17 was the very first plane produced by Saab, and incorporated many of the lessons and experiences acquired with the licensed-manufacturing of the Northrop 8-A1 bomber by ASJA and then Saab itself, being also the first then modern all-metal light bomber produced by Sweden during WWII. As the m/42 bomb-sight was developed and introduced for this aircraft, it was reportedly exported to the US. If there is something that makes the B 17 a remarkable design, it is the fact that modifications to its landing gear allows the plane to operate from any type of terrain… literally. The main landing gear configuration is that with wheels for normal operations in normal airstrips. But when winter comes, the wheels could be replaced with skis, allowing the airplane to operate even in harsh cold weather conditions with snow-covered airstrips. This might indicate that Sweden needed an all-time available air asset to defend its sovereignty and neutrality, or maybe that it absorbed the operational lessons the Swedish Volunteer squadron that took part during the Winter War, or the lessons provided by that same conflict. But the B 17 received another modification that allowed it to operate from the surface of any water body, as it could be fitted with two floats replacing the wheeled-landing gears, becoming the B 17BS. This variant was mainly used for water-borne aerial reconnaissance. Despite being a rather obscured airplane in history, the B 17 would have been one of the few neutral airplanes to take actual part in a conflict, besides those belonging to the Flygvapnet that took part during the Winter War. For instance, the Danish Brigade, a unit comprised of refugee Danish airmen supported and equipped by Sweden, would have been close to assist in the liberation of their country, if it weren’t for the fact that the Swedish government did not allow it to take off with the supplied B 17 units to Denmark. The B 17s were then offered to the Danish Air Force, but were rejected as the German surrender took place some days before the offering was made, being returned to the Flygvapnet. But the adventures of the B 17 would not finish there, Ethiopian country was looking for assistance in building a more advanced air force of its own after WWII. Sweden became the main supporter of this small air force, supplying Saab Safir trainers and B 17 light bombers, as they later were being phased out in 1947. It also employed some former Flygvapnet personnel and under orders of Carl Gustav von Rosen, who also became the chief instructor of the rebuilt Imperial Ethiopian Air Force. It remained in service there until 1968. L-10 – The prototype version of the B 17 under the denomination it had when ASJA was tasked with the design and development process. One unit was powered by a NOHAB-made Bristol Mercury XII 880hp engine and another was powered by a Pratt & Whitney R-1830 Twin Wasp engine. B 17A – Bomber version powered by a Pratt & Whitney R-1830-S1C3G Twin Wasp engine of 1050 to 1200 hp. Some units were modified to carry air-to-ground rockets. 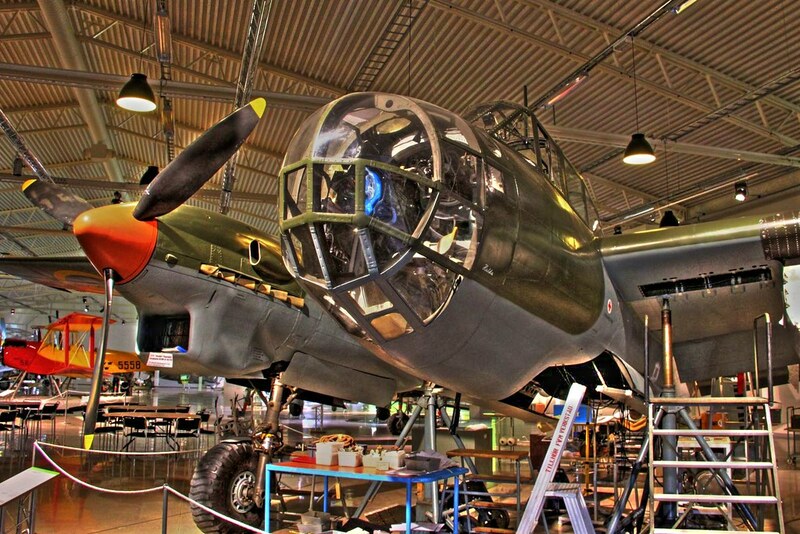 The armament of this version became standard for the bombers and its other variants: 2x8mm machine guns placed on the wings and firing forwards, and an 8mm rear machine gun placed at the second crewman’s post, along a 500 kg (1,102 lb) bomb. 132 units delivered. B 17B – Bomber version powered with a Swedish-built Bristol Mercury XXIV (Svenska Flygmotor Aktiebolaget SFA) engine, with the same armament configuration except for a 700 kg (1,500 lb) bomb. 55 units delivered. B 17B I – Dive-bomber version fitted with a trapeze under the fuselage, carrying a 500 Kg (1,500 lb) bomb, and underwing hardpoints for bombs. It was equipped with the m/42 bombsight. B 17B II – A light level bombing version fitted with an internal bomb bay and underwing hardpoints. B 17BL – Reconnaissance version fitted with a wheeled landing gear and a camera in the fuselage, replacing the HE 5 Hansa and the Fokker C.VD/C.VE. 21 units delivered. B 17BS – Reconnaissance floatplane version fitted with twin floats, aerodynamic struts, and endplates on the horizontal stabilizers. 38 units delivered. B 17C – Another bomber version fitted with the Piaggio P.XIbis R.C.40D 1040hp engine, and carrying a 700 kg (1,500 lb) bomb. 77 units produced. The Flygvapnet was the main operator of the B 17, with 132 units of the B 17A model, 55 units of the B 17B and its modified sub-variants, and 77 of the B 17C variant. The first model was fitted with an inner bomb bay with some airframes modified to carry air-to-ground rockets. The following version was used as bomber – equipped with the advanced m/42 bombsight and some with the trapeze and underwing hardpoints – up until 1945. Some airframes were modified for reconnaissance duties and subsequently equipped with cameras. These modified aricraft served until 1949. Some airframes received further modifications such as the twin floats and other structural modifications. The B 17C was used for bombing missions, having an internal bomb bay and hardpoints until 1948, when they were withdrawn due to problems with the engines. The B 17 operated in six squadrons from 1942 to 1949 as it follows: the B 17 bomber and dive-bomber versions operated in F4 Frösön, F6 Karlsborg, F7 Stenäs, and F12 Kalmar. The B 17BS sea-based planes operated with F2 Hägernäs, and the land-based reconnaissance planes operated in the F3 Malmslätt.Following the B 17 withdrawal from service with the Flygvapnet, the airplane was operated by civilian companies for various purposes, target towing included. Two B 17BS were purchased by the Osterman Aero and used to carry fish and shellfish from Bergen (Norway) to the Swedish capital. In addition, 19 B 17A were loaned to AVIA and Svensk Flygtjänsk AB and modified for target towing; 5 of them received ECM equipment in 1959. One B 17A remains airworthy in airshows, with 2 additional airframes used as museum displays. The Ilmavoimat (Finnish Air Force) received two B 17A for target towing tasks, which were lost in accidents. The Österreischische Luftstreitkräfte (Austrian Air Force) received a B 17A via Svensk Flygtjänsk AB in 1957. This was done to facilitate the deal as it was a privately-owned airplane, considering the restrictions the Swedish government sets on sales abroad on Swedish-made military equipment. As this country was under German occupation, a Danish brigade was established in Sweden in 1943 with 15 pilots and equipped with 15 B 17C under loan, taking part in training and exercises with the Flygvapnet, being painted with Danish colors. They were not given permission to leave the Swedish territory despite being ready to enter action against the Germans; the 15 units were offered to Denmark, but this country never accepted them, with Germany surrendering some time after the offer was made. One remains as a display in a museum. The Ethiopian Air Force received 46 B 17As between 1947-1953 as the airplanes were being phased out in Sweden, and mainly as Sweden agreed to support the establishment of the Ethiopian Air Force under the lead of Carl Gustav von Rosen and with some former Flygvapnet personnel. The Ethiopian B 17 remained in service until 1968. Engine 1x Piaggio P.XIbis R.C.40D 9 cylinders air-cooled radial piston engine, with a 3-bladed Piaggio P.1001 variable propeller. Up to 700 kg (1,500 lb) of bombs, the B 17B could carry a similar payload, while the B 17A could carry a 500-kg bomb (1,102 lb). The reconnaissance versions had a Type N2 Camera. The Saab 18 is another example of Sweden’s efforts to produce an aircraft to safeguard its neutrality, considering that the same War and international political context prompted the Scandinavian nation to do so. Only that this plane was not devised to keep the skies of Sweden, but rather to protect the national territory from the air. Curiously, when WWII started, the Saab B 17 was given priority at the earlier stages of the war, as a dive bomber was considered more necessary than a light/medium bomber. This plane gave also important contributions to the development of the Swedish aeronautic and military industry, contributing in the development of ejection seats and of air-to-surface (or AGM) missiles; more specifically, anti-ship missiles. Despite being required to maintain Sweden’s neutrality and protect its territory, it entered in service in 1944, quite late to address the threat from Germany but ready to address the threat from the East and to serve at the early days of the Cold War, with distinction. It became also the standard bomber of the Flygvapnet. The Saab B 18 is a light bomber and reconnaissance plane with three seats, two engines and a double tail, with a design similar to that of the Junkers Ju 86 and the Dornier Do 17 with the rounded shape of the vertical stabilizers. Or simply the very characteristic shape of double tail and double engine bombers of the era: this is, the cockpit placed at the frontal section of the plane and with the bow being made entirely of glass (normally the place of the bomber), and the cockpit being of a glazed offset type with the pilot and navigator. The wing has a trapezoid shape, being a straight leading edge type with the rear part being instead angled. The Saab B 18 was initially intended to be powered by British-made Bristol Taurus engines. But it received in the end two types of engines during its career as the Taurus engines weren’t available, powered instead with two Pratt & Whitney R-1830 Twin Wasp radial engines of 1065 hp (the Saab J 21 had priority in receiving the Daimler Benz engines). Posterior versions received new powerplants as the Pratt & Whitney were deemed insufficient, hence receiving 2 Daimler Benz DB 605 of 1475 hp, enabling the plane to reach speeds of up to 570 km/h (357 mph), and making of the B 18 one of the fastest light bombers producing during the war. The powerplant was not the only modification the B 18 suffered during its service with the Flygvapnet, as the initial configuration of armament of 3 x 13,2 mm machine guns was changed to a set of one 7,92mm gun and 2 X 13,2mm machine guns (B 18B). Another re-configuration was the instalment of 2 X 20mm cannons and a 57mm gun (T 18B), along with rockets instead of bombs. Noteworthy to point out that the B 18 could carry up to 1,000 kg of bombs in the compartment and 8 x 50 kg bombs at the wings. As reconnaissance and torpedo-bomber variants were developed (though the last one was never put into service), the versatility and adaptability of the B 18 was made evident, at the point of being the platform for testing the Rb 302 anti-ship missiles. The crew was also modified, as following versions needed only two crewmen as rockets were introduced, suppressing the bomber. Both versions (B 18B and T 18B) received another modification of armament in the 50’s, as they were fitted with rocket launchers allowing a maximum of 4 rockets on each wing, and even another rocket launcher allowing 2 or 4 rockets under the nose. The bomb sight was also equipped with an automatic reflex sight for rocket firing. This conversion meant that the B18B and the T18B would have increased – and more specialized – attack roles. Also, both the B 18B and the T 18B received ejection seats, maximizing the safety of the crew operating with these air assets. In addition, some B18 B units were fitted with two radars (a radar altimeter PH-10 and a search radar PS-18/A, which was a US Navy AN/APS-4 naval radar) for target designation and identification. This airplane was purposed at replacing the Junkers Ju 86 in service with the Swedish Air Force back then, basing the requirement for a fast bomber with a crew of three. This was later on changed to a bomber having a crew of 3, a bomb payload of up to 750 kg (1653,46 lb), capable of reaching speeds of 500 km/h (310,68 mph) and to be used as a long-range reconnaissance, torpedo-bomber and heavy fighter. The fact that the B 18 ended in serving with the Flygvapnet was a sheer product of luck, as the competition’s design (the GV8 proposed by the competing AB Götaverken) was capable of meeting the requirements. Yet its costs and the departure of Götaverken’s chief designer resulted in Saab awarding the contract in 1938. As development began, many Americans reportedly took part in the design and development process, resulting in the B 18 having some “American traits” in the design. As a result, the B 18 development had a Swedish and an American chief designer: Frid Wänström and Carl Haddon, respectively. The development process was delayed by two factors explaining the reasons of the Saab B 18 entering in service relatively late: first, the abovementioned shifting in priorities once the war started, with the Saab B 17 dive bomber receiving priority over the Saab B 18. And second, a change in requirements from a light bomber to a medium bomber, which ended in increasing the development time. The first flight took place in 1942, entering in service in 1944 with two initial versions: the B 18A bomber and the S 18A reconnaissance versions. A torpedo-bomber and later attack plane (T 18B), and a dive bomber (B 18B) were developed, receiving ejection seats. After WWII and in the wake of the Cold War, the B 18B had a very interesting career, as the increase of the Soviet threat asked for reconnaissance missions; in 1945 and 1946 the B18 B was used to reach the Baltic coast and take pictures of every Soviet vessel, meeting Soviet fighters almost every time. 244 units were produced with the Flygvapnet being the sole operator until 1959, year in which the Saab 32 Lansen replaced the B 18: 62 units of the B 18A, 120 units of the B 18B, and 62 units off the T 18B were built. A single surviving airframe is displayed at the Flygvapenmuseum. The design of the B 18 is very typical of the pre-WWII double-tail light or medium bombers, having some interesting features despite its conventional sight at first glance. The B 18 is a straight leading edge wing airplane, with the engines placed at the first half of the wings. The fuselage was entirely made of metal, with fabric covering the control surfaces, and having the armor being integrally part of the structure. The most remarkable areas are the canopy, the bow section, and the rear horizontal stabilizers, connecting the two vertical stabilizers with the main airframe. Regarding the canopy and bow section, the canopy is not placed at the longitudinal middle of the plane as it is normally placed, being instead an offset type at the left side. There, the pilot and the navigator were stationed, with the navigator seat being placed backwards. In addition, the bow section had a glazed tip where the bomber was stationed. Reportedly, such scheme improved the visibility for the pilot. The nose of the T 18B version was slightly modified. And the bow inferior section is not entirely straight, having instead an undernose gondola right before the wing-roots. The landing gear was of classic configuration, with the frontal landing gears retracting into the engine gondolas, while the small rear landing gear was placed at the stern of the bomber, right before the horizontal and vertical stabilizers area. In turn, the horizontal stabilizers are of a ‘butterfly shape’, having at the tips the two horizontal stabilizers; the rudders occupied the whole posterior area of the tails. The shape of the vertical stabilizers is of an isosceles trapezoid. The wing is a mid-wing (cantilever) leading edge wing, with a shape of a right trapezoid and where the two engines are installed, along with the main fuel tanks. In some versions, there was a gun or a cannon installed at one of the wing-roots. The engines, depending of the version, were either a couple of Pratt & Whitney R-1830 Twin Wasp radial engines or a couple of licensed-built Daimler Benz DB 605 liquid cooled inline V-inverted engines. Depending of the installed engines, the air intake might be located below the engine gondola or above the engine gondola. Normally the earlier versions of the B 18 can be identifying by the intakes placed above the engine gondola. The Daimler Benz engine gave the B 18 a quite remarkable speed for a plane of its type back then, being among the fast ones with speeds of 575 km/h (357 mph). Such speed would provide an advantage for attack and reconnaissance missions. Reportedly, the T 18B version could reach speeds of up to 600 km/h (372,82 mph). The propellers of the B 18 where a three-bladed type. The armament configuration also varied from version to version. The initial configuration was of 3 x 13,2mm machine guns, one firing forwards at the wing root, another firing also forwards at the nose, and another at the rear. This set was then changed for a set of one wing root 7,62mm machine gun and two 13,2mm guns, and then it was changed for a set of a front-firing 57mm Bofors gun at the undernose gondola and 2 x 20mm guns. The B 18 could carry up to 1,000 kg (2,200 lb) bomb and the bombs compartment and up to 8 x 50 kg (110 lb) bombs at the wings. This type of offensive armament was also changed, as it was first modified to carry a torpedo, which never came to be operational, and then it carried up to eight air-to-surface rockets. The B 18 was also used to test the Rb 302 anti-ship missile. The reconnaissance version was fitted with various cameras to perform its mission, along with a radar. The B 18 was among the first planes in receiving ejection seats, as its high attrition rate made the Flygvapnet to implement such measure for the sake of the crew’s safety. The fact that it had ejection seats and capacity to carry missiles, along with its speed and un-conventional design, makes the B 18 a very interesting design made by a neutral nation during WWII and the early Cold War. The B 18, although entering quite late to have a remarkable role in defending Sweden’s neutrality as WWII unfolded, it became a very valuable asset for the Nordic nation at the last stage of the war, when the Soviet Union became stronger and advanced towards the West, with the Cold War highlighting the threat it posed to Sweden. Not only its speed and considerable armament made the B 18 an air asset to be reckoned with, but also its versatility and adaptability, let alone its flexibility. The design allowed the installation of new engines that increased the speed of the B 18, as well as a change of armament while in service, at the point of serving as a test bed for one of the earlier anti-ship missiles, the Rb 302. These modifications allowed the B 18 to become very effective bomber and ground-attack planes, and even to serve as a reconnaissance plane capable of approaching or even penetrating Soviet airspace for its missions, facing quite often the Soviet fighters. One of the characteristics that made the B 18 an airplane to be reckoned with was beyond any doubt its speed, especially after the Daimler Benz 305. The B 18B could reach speed of 570 km/h (357 mph), and the T 18B, the most powerful version in terms of firepower, could reach speeds of up to 600 km/h (372,82 mph). This was an advantage when it came to perform bombing or strike attacks with rockets, as the B 18 could have hit any advancing enemy ground forces formation with hit-and-run tactics or simply by direct strikes with devastating effects. Curiously, the S 18A was the slowest version, with speeds of up to 465 km/h being the maximum speed; this can be explained by the fact it was powered by the previous Pratt & Whitney engines, as the S 18A was a direct modification from the B 18A, which was (under)powered by such engines. Nevertheless, as the powerplants were enhanced, the B 18 became a very fast medium bomber. And it could have posed a serious threat to naval surface units approaching the Swedish coast. 18A – Two prototypes powered by Pratt & Whitney R-1830 Twin Wasp engines of 1065 hp. B 18A – This version became the first series version of the B 18, powered with the abovementioned Pratt & Whitney engines. Armed with 3 x 13,2 mm machine guns and up to 1400 kg (3086.47 lbs). 55 units were reportedly converted into the S 18A reconnaissance version in 146-47. 62 units delivered. S 18A – A modified version of the B 18A for reconnaissance purposes, replacing the Caproni Ca 313 (S16) reconnaissance plane in service back then. It was fitted with a varied array of cameras: 3 high-altitude 10/92 and 5/25 cm cameras, 1 panoramic 10/105 cm camera and a 13/30 cm night camera. This version was also fitted with a PS-18A (An American-made AN/APS-4) maritime surveillance radar, with 36 units having this radar installed in pods under the nose, and serving as maritime reconnaissance airplanes. Saab 18B – A single prototype powered with the Daimler Benz DB 605B. B 18B – A dive bomber version powered by the new Daimler Benz DB 605B of 1475 hp engines. It was later on modified to carry up to 8 air-to-surface rockets, becoming an attack plane. Armed with a 13 mm machine gun and a 20 mm gun plus the 1400 kg (3086.47 lbs) payload of bombs, and later on the 8 air-to-surface rockets. A dive bomb sight m/42 developed by Saab engineer Erik Wilkenson maximized its attack capabilities. Reportedly, some B 18B received a PS-18A radar. This version received ejection seats, and had the crew modified, reducing it to two (pilot and navigator/radio operator). 120 units delivered. T 18B – A projected torpedo-bomber to serve as an anti-ship asset, it ended in being a ground-attack plane thus receiving an armament of a 13mm machine gun, 2 x 20mm guns and a 57mm Bofors cannon at the undernose gondola, receiving later on air-to-surface rockets. This version also received ejection seats. 62 units delivered. The Flygvapnet was the sole operator of the B 18, which entered in service in 1944 with 62 units of the B 18A model, followed shortly by 120 units of the B 18B that were initially purposed as dive bombers, developed later on into the T 18B with 62 units, which served as a ground-attack plane. The T 18B, in turn, was initially purposed to be a torpedo-bomber, but given problems with the new payload, received instead rockets hence serving as attacker. Some airframes were modified to be the S 18A reconnaissance plane, performing reconnaissance missions off the Soviet Baltic coast in the aftermath of WWII. It remained in service until 1958, year in which the Saab 32 Lansen replaced the B 18. It was used for testing the Rb 302 anti-ship missiles. The B 18B operated in 4 squadrons from 1944 to 1958: F1 Västerås, F7 Såtenäs, F14 Halmstad, and F17 Kallinge. The T 18B torpedo-bomber/attack aircraft operated also in the F17 Kallinge from 1948 to 1958. The S 18A operated in three squadrons in the same perios of time: F3 Malmen, F11 Nyköping and F 21 Luleå. A single B 18B recovered from a lake remains as a museum exhibition. Engine 2 X Daimler Benz DB 605 of 1475hp (some were licensed-built versions made by Svenska flygmotor AB). The FFVS (Kungliga Flygförvaltningens Flygverkstad i Stockholm/Royal Air Administration Aircraft Factory in Stockholm) J 22 was a small light fighter airplane, and an exception to the mostly Saab-built airplanes, which were the ones equipping the Flygvapnet the most. But like those made by Saab during WWII and the early Cold War, this aircraft is a product of the defence needs that the war was imposing upon the Scandinavian nation. Although not so renown as its colleagues, this fighter proved to be a feat of Swedish capacities during dire times and tight resources, compensating its comparatively small size with good firepower and good performance. Of course, and like all of Swedish-made (and imported) air assets, it was purposed with giving Sweden with tools enough to defend its territorial and airspace integrity and security, let alone its neutrality. This under a locally built armament programme while facing restrictions to foreign advanced aviation technology. A single-seat, single-engine airplane. Its design is conventional, yet the wings are placed further bow of the airframe, with a trapezoid shape. The nose is very similar to those of the American-made fighters, with a wide and cylindrical shape due to the shape of the engine. The cockpit was also placed at the bow section of the fighter, yet slightly aft the leading edge of the wing. The canopy was a bird-canopy design. The canopy hinged to the right side. The J 22 was powered by a SFA STWC-3G 14-cylinder air-cooled radial engine of 1065 hp, which was an unlicensed version of the Pratt & Whitney R-1830 engine. A three propeller-blade composed the other propulsion element of the aircraft. The engine-propeller combination allowed the J 22 to yield speeds up to 575 km/h (360 mph), being this speed aimed to make the fighter comparable to the Messerschmitt Me109 and Supermarine Spitfire. The first version of the fighter (J 22A/J 22-1) was armed with a set of 2 X 7,9mm and 2 X 13,2mm light and heavy machine guns. The second version (J 22B/J 22-2) was armed with a set of 4 X 13,2mm heavy machine guns. As it not carried bombs or rockets as secondary weapons like most fighter designs of those days, it was a 100%-designed fighter. The J 22 entered in with the Flygvapnet in 1943, remaining in that until 1952, year of its retirement, with 198 fighters built from 1942 to 1946. During its service, it was well received by the pilots, thanks to its good manoeuvrability and responsive controls, capable of giving a fight to the Mustangs P-51 at heights up to 5000 meters (16,000 fts). It did not have stall problems at turns or straight forward course, and the second version (J 22B/J 22-2) was considered the best in terms of firepower. Moreover, the simple systems facilitated maintenance and service. The J 22 was reportedly comparable to the early versions of the Supermarine Spitfire and of the Mitsubishi A6M Zero. Three J 22 are preserved as static displays in museums. The design of the J 22 is a conventional one, being a small and lightweight airplane, whose shape is very similar to most US airplanes of the era. The fighter is a cantilever mid-wing design, with its structure being a mixed steel tube and wood construction (plywood) one. In fact, the tubular-steel framework and fuselage were having coverings of moulded plywood panels. The only drawback of the design was that forward visibility was poor. The J22 wing has the average shape of most WWII-era fighters, a trapezoid shape. It was located slightly towards the bow of the airplane, containing the fighter’s guns and the fuel tanks. In addition, the air intakes were placed at the roots of the wings. The aft section of the airplane contained the vertical and horizontal stabilizers, with the rudder dominating most of the tail, while and as a result, the horizontal stabilizers were placed before the rudder. The landing gear, in turn, was also of classic configuration – two ‘legs’ with the wheel and a tailwheel – being also retractable and rotating, very similar to the Vought-Chance Corsair F4U. The only problem with the tailwheel was that, if left unlocked and able to swivel, it could result in ground-loops. Interestingly, the landing gear was designed to accept skies, that were never installed as snow-clearance service of the runways was improved. The engine was a SFA STWC-3G 14-cylinder air-cooled radial engine of 1065 hp, an unlicensed copy of the American-made Pratt & Whitney R-1830 engine, allowing speeds of up to 575 km/h (360 mph). given the shape of the engine, the nose has the characteristic cylindrical shape of the American homologues. The propelling system was comprised of a three-blade license-built Hamilton standard propeller connected to the engine. Alongside speed, the J 22 was deemed a manoeuvrable and easy to control fighter with good performance especially at low altitudes. Furthermore, it had no stalling problems but the tendency to flip over its back if pulling hard when turning. It was considered capable to outperform the P-51 Mustangs, and be equal to the early versions of the Zero and the Spitfire. The armament had different configurations on the two main versions: The J 22A (J 22-1) was armed with 2 X 7,9mm and 2 X 13,2mm machine guns. The J 22B (J 22-2) was armed with 4 X 13,2mm machine guns. In both cases, the armament was placed at the wings. No secondary weapons were carried. The canopy was of a bird-cage type, which hinged to the right to allow the pilot to enter and exit the airplane, with the windshield made of 6mm laminated Gremax or acrylic, and the center part being thickened with 60mm for ballistic protection. The gunsight was a fixed reflex sight. Noteworthy to point out, that 500 hundred contractors produced 12000 of the 17000 total parts of the J 22. The J 22 is also a product of the need to defend the airspace and the neutrality of Sweden, as modern air assets were required to meet this objective. By the beginning of WWII, Sweden was having 60 Seversky P-35 (of the 120 ordered), 60 Italian-made Reggiane 2000 and 72 Fiat CR. 42 biplanes – bought as a temporary measure – and old Gloster Gladiator fighters. As Sweden did never receive the remaining 60 P-35 and 144 Vultee P-66 Vanguard it ordered from the US, due to the embargo imposed to any arms delivered to any country but the United Kingdom after the invasion of Norway by Germany, in 1940. As a result, Sweden bought the abovementioned Italian fighters to provide the Flygvapnet with some air assets, but it was deemed necessary to introduce up-to-date fighters. Initially, Sweden considered to buy additional fighters from abroad, such as the Finnish VL Mysky, the Soviet Polikarkov I-16 and even the Japanese Mitsubishi A6M Zero. But these options were having problems, such as not bing enough or being impossible to transport into Sweden despite being available, s it was the case of the Zero. As a result, the FFVS was established, as Saab was already concentrating on the fabrication and development of bombers and fighters, with the sole purpose of developing and manufacturing a new lightweight fighter that would provide the Flygvapnet the needed modern air assets to keeps its neutrality in a world at war. Consequently, it replaced the Gladiator, the Severski, and Reggiane and Fiat fighters while other air asserts were received – like the Mustang P-51 – and the Saab J 21 was ready to enter into service. Although the J 22 was a very small and lightweight fighter, it was a very capable one, proving itself to be able to undertake its purposed task: defend the Swedish airspace and neutrality. The secret of its good performance was its engine and structure. It was among the fast fighters the Flygvapnet had back then, reaching speeds of 575 Km/h (360 mph). It was also a manoeuvrable fighter, with a fast turning rate – it was even capable of getting the Mustang in the gunsight by out-turning It – with responsive controls. The altitude where it tended to perform the best was at low altitudes, with the performance decreasing at higher altitudes. Stall problems where rather absent, and it was an airplane easy to maintain and service by land maintenance crews. J 22A (J 22-1) – First production series armed with 2 X ,9 mm M/39A (Browning M2) machine guns and 2 X 13,2 mm heavy machine guns. Operated until 1952. 143 delivered. J 22B (J 22-2) – Second production series armed with 4 X 13,2 mm M/39A (Browning M2) heavy machine guns. 55 delivered. S 22 (J 22-3) – Reconnaissance version (the S stands for spaning, or ‘reconnaissance’ in Swedish), equipped with a vertically mounted camera. Developed from J 22A (J 22-1) airframes in 1946, refitted as fighters in 1947. Operated until 1952. 9 airframes modified and refitted. Sweden – The Flygvapnet operated the J 22 during the last half of WWII, being also in service during the earlier days of the Cold War, as it was retired until 1952. A total of 198 airframes were in service, being 143 of the J 22A version, 55 of the J 22B version and 9 airframes of the first version modified to produce the S 22 version, which served for a very short period of time as reconnaissance airplane. In 1945 all the J 22 were re-designated as J 22-1 for the first version, J 22-2 for the second version, and J 22-3 for the third version. These last airplanes were re-conditioned a year later as fighters. Three J 22 remain today as museum exhibitions in Sweden. It served with seven squadrons throughout its career: F3 Malmen; F8 Bakarby; F9 Säve; F10 Barkråka; F13 Bråvalla; F16 Uppsala; and F18 Tullinge. The S22 (J 22-3) served only in the F3 Malmen squadron. 2 X 7,9 mm M/39A (Browning M2) machine guns and 2 X 13,2 mm heavy machine guns located at the wings (J 22-1). 4 X 13,2 mm M/39A (Browning M2) heavy machine guns located at the wings (J 22-2).